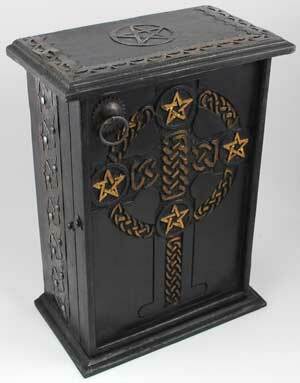 Sculpted of wood, this altar cupboard displays a Celtic cross with an interwoven pentagram at each corner of the cross. 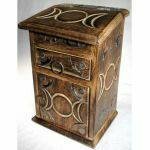 This makes it a powerful symbol of unity between the elements and the divine forces that combine them. Two shelves. 11" x 8" x 4 1/2"